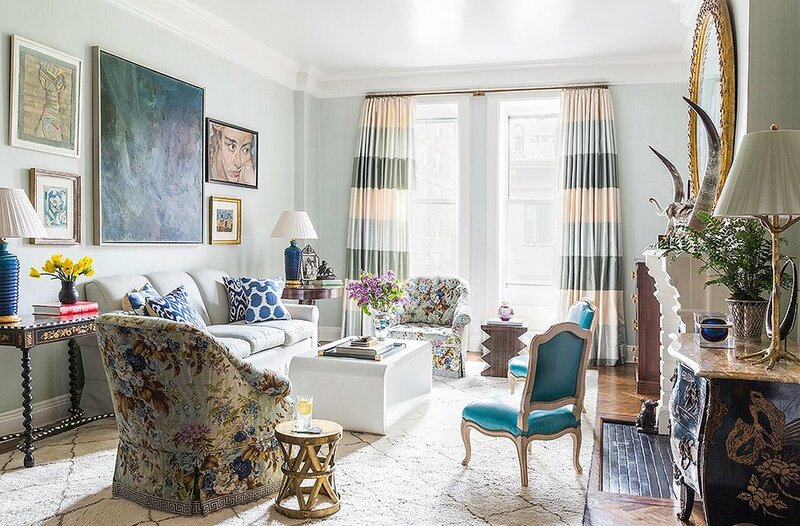 I recently came across the NYC home of designer CeCe Barfield Thompson (owner of CeCe Barfield Inc.) on the One Kings Lane website and immediately loved it. CeCe (who once worked under the iconic Bunny Williams) has a masters' degree in historic preservation (I didn't even know that was a thing but now I wish that was what my masters' was in) said her and her husband always knew they wanted to live on Gramercy Park in Manhattan, so when a place became available they didn't hesitate. They certainly made the right choice because their apartment is STUNNING! These park side apartments are unique in NYC because of all the preserved details and the private green space that surrounds them - two important features that you certainly can't find everywhere in Manhattan! Take a look at her space below! 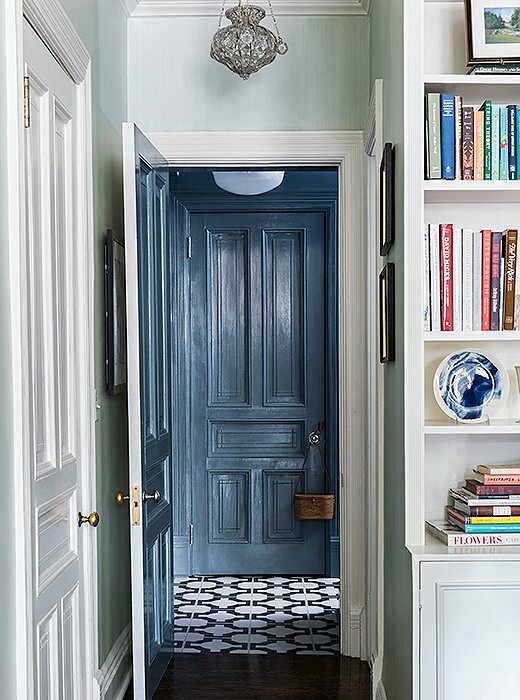 Various shades of blue flow throughout the entire home. The living room provides a view of the treetops and some of NYC's skyline because the surrounding are all built low! 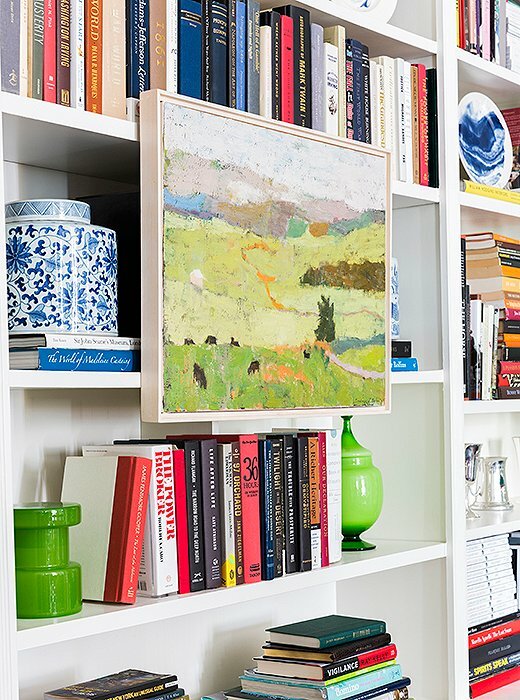 A perfectly styled shelf with floating artwork! 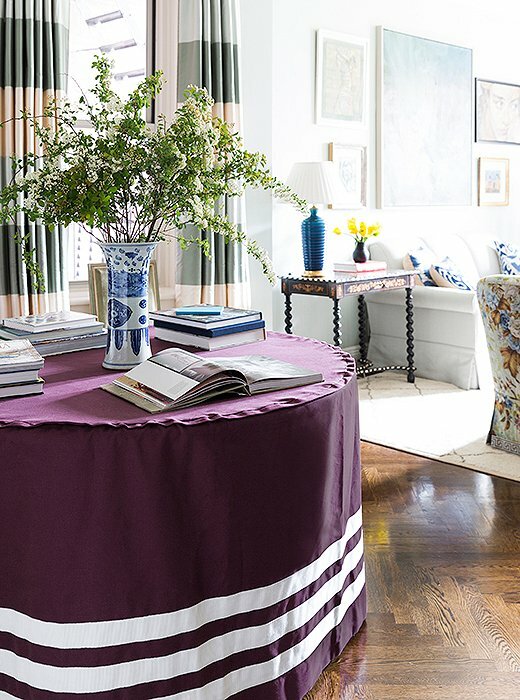 This skirted table may be my favourite piece in the entire apartment. Not only does it serve as accent/entryway table, this is also the family's dining table (it can seat up to 16) and she uses it as a desk! As a family with young kids, a formal dining room was not needed and this table can be transformed for different uses. Such a good idea for any small space! I love the kitchen! Can you believe they only completed small changes in this room?! 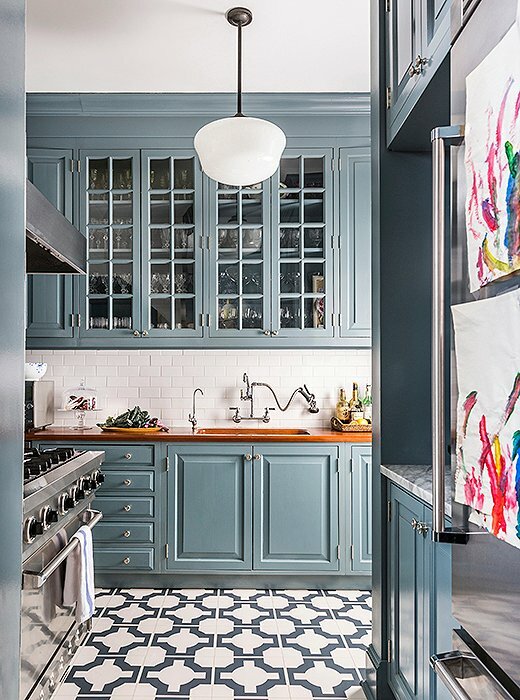 The original cabinets were re-painted using a glossy paint, the flooring is patternend linoleum tiles which were laid on top of the existing floors, and the countertops are butcher block. 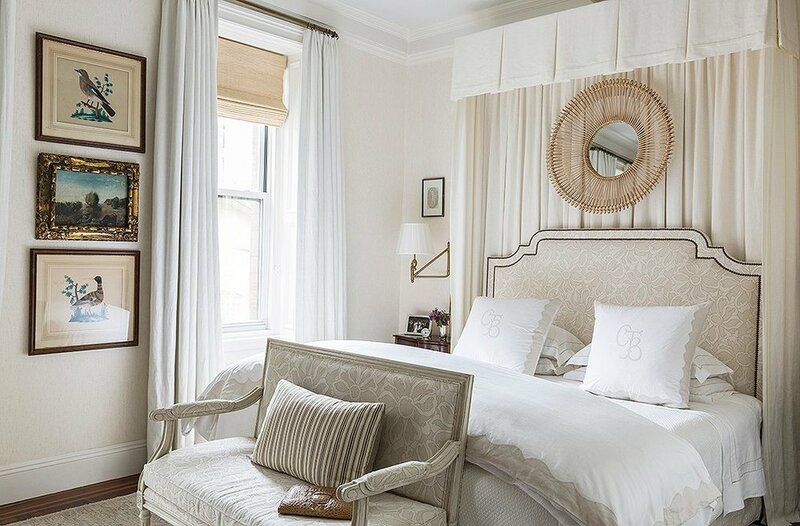 A perfectly layered neutral master bedroom - layers are key when working with one colour palette. This bathroom has a 'kid size' tub! 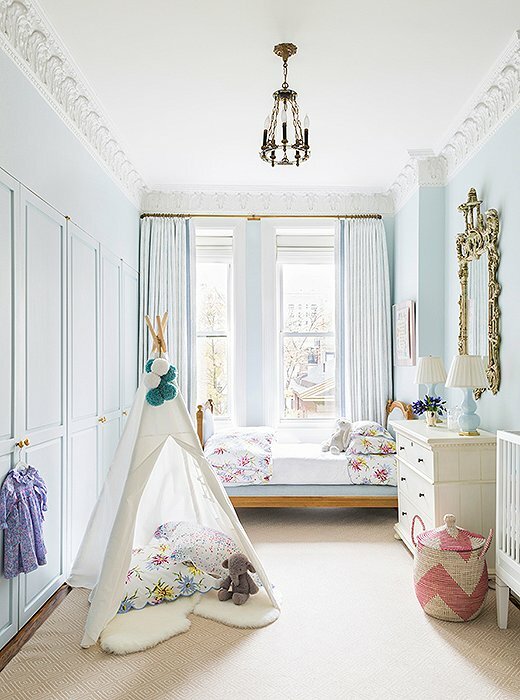 The girl's room is amazing - kid friendly yet sophisticated without being distinctly childish. 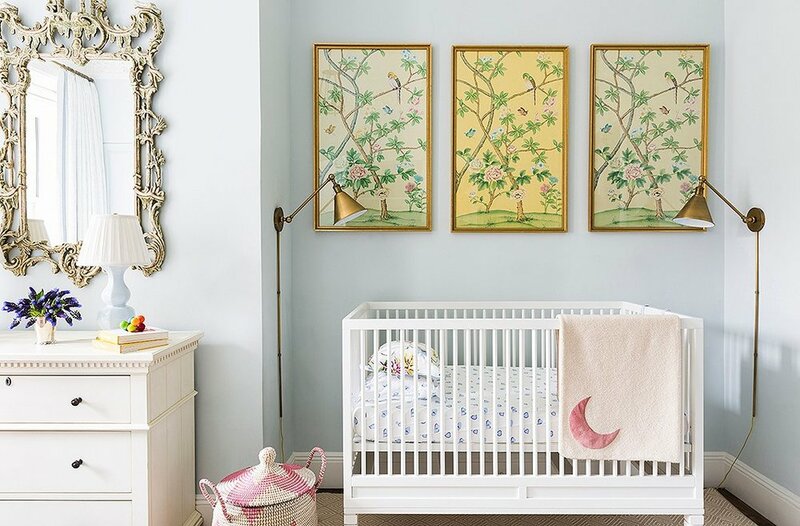 The wallpaper panels once hung in CeCe's parents dining room - a great example that kid's rooms don't have to be filled with kid-specific accessodies and decor!